Today, our lifestyles are extremely mobile. We stay connected to the world through out mobile devices, and we can do anything from them, from anywhere in the world. Online banking, travel reservations, email and social media can all be accessed with a tap of the finger. That’s why you need to know these mobile security tips. But what happens if you accidentally leave your mobile device behind, say, at a restaurant, work, or at the local bar? How confident would you be that nobody else could access your information? When browsing the Internet, how confident are you that your information is only being viewed by you? 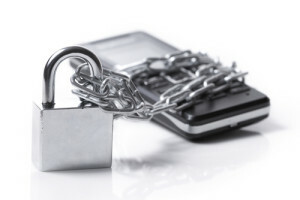 In today’s blog post, I will share with you 3 quick mobile security tips that you can follow to help you boost your confidence in mobile security. In regards to mobile security, this is your first line of defense for protecting your data. This can be a 4 digit code, a swipe pattern, or even a full password you type in to unlock your device. If someone stole your mobile device and wanted to access it, they would need to break this code first. This is actually a hard thing to crack, and can act as a deterrent against the theft in the first place. On some devices, there is even an option you can turn on that will automatically wipe the phone after a certain number of unsuccessful attempts. This would help ensure that even if your phone was stolen, your information would not be accessed. For that reason, at a minimum, you should set a pin or pass code as your first line of defense. Warning: Some devices have a very shiny screen that shows a lot of dirt and oils from our fingers, and when we swipe or touch the screens they leave a mark. I have seen where a simple key code or swipe pattern could be followed just by looking at the most recent oil pattern. For that reason, you should clean the screen of your phone often. With the thousands of potential applications that can be installed on your phone, many involve more than just crushing candy or shooting birds at pigs.Certain applications can help you locate a lost or stolen phone through the GPS service. In fact, Apple offers a service called Find my iPhone that does just that. Not to leave out the Android users, the Android Device Manager offers a similar solution. Last but not least, Windows Mobile users have this option in the Windows Phone website. Also, many third party applications also offer a similar solution. Here at SurePoint IT Solutions, we offer many cloud solutions that have this feature built in, such as Office 365. Are you a business and have many mobile devices? Our Mobile Device Management platform for businesses help you keep your devices safe and secure. Contact us for more information on these services. Did you know that there is now Viruses and Malware that can infect your mobile device? For this reason, we recommend installing a mobile ready antivirus or malware scanner. Think about it, your phones are mini computers, and just like your desktop computers, they need to be cleaned up periodically. If infected, malware and viruses could access the information stored on your mobile device. Even worse, malware has a “snowball” effect in that it can slow down your phone over time. To help prevent this, look for an IT Provider that offers Malwarebytes as a solution to this problem for mobile devices AND computers. This will ensure your endpoints are secure and clean. You should also consider Webroot as an antivirus solution for your business.Webroot is a new generation cloud driven antivirus that protects your computers and mobile devices from malware and infections. In even comes equipped with internet security, which detects any malicious activity in your internet browser. Did you know? Customers of SurePoint IT Solutions enjoy using both of these solutions because they come included in the SureCare service. For more information on SureCare, click here. In the end, the best security measure for your mobile devices is YOU. Be proactive and put one of the above 3 quick mobile security tips in place. What about you? Do you have a mobile security tip you can share with us? Do you have an IT company that helps manage your devices? We’d love to hear from you. Leave a comment below with your feedback! Mike is a tech guru that loves spending time outdoors. When not at the helm of SurePoint IT Solutions, you can find him hiking or mountain biking. Like what we have to say? Sign up to receive an email each time we make a new blog post. You have Successfully Subscribed! Check your Inbox for the confirmation email. Secure your mobile devices by applying these 3 Quick Security Tips. Why Is It Important to Backup Your Data? Have you upgraded to Microsoft Office 365? If not, what are you waiting for? You have Successfully Subscribed! Please check your Inbox for the confirmation email. Don't Have Time To Read Now? Sign up to receive new posts in your Inbox and stay up to date on the latest computer information from SurePoint IT Solutions. You have Successfully Subscribed! Please check your Inbox for a confirmation email. Help spread the word! Share this post with your friends!